While you’re off staring at redwoods and pretending you’re a character in Sideways (a character traveling with two children well under drinking age), I’ve been recovering from Spring Break ’05. We had a splendid peaks ‘n’ valleys classic family trip: plenty of car time, punctuated at one point by Clif’s flat-voiced chant “Are we there yet?” which went on so long that he put himself to sleep. We saw Rock City. We continued our tour of Aquariums Of The Southeast, and got a full dose of things with suckers. And we saw the strangest creature we’ve ever seen: the leafy seadragon, a seahorse that looks like a floating salad. Unbelievable. Among the historical highlights was a visit to Atlanta’s famed Tom Moreland Interchange, aka “Spaghetti Junction,” where I-85 and I-whatever collide, giving the children a great hands-on experience in the effects of suburban sprawl. After an hour of gridlock and Disc 2 of The Incredibles (which made me boohoo all over again to hear Brad Bird talk about how he made that movie), we finally made it to Pirate’s Cove for the most stirring round of miniature golf ever. Every trip has its perfect moment. I managed to sneak away to Strands and Strings or whatever for a souvenir–some tomatoey Araucania Nature Cotton. Thank you all for crucial guidance on Atlanta yarn stores at a desperate moment. Along the way I taught myself how to knit while in a car without queasing out. (The key: look up a lot.) This large achievement opened up blessed uninterrupted hours of handwork. 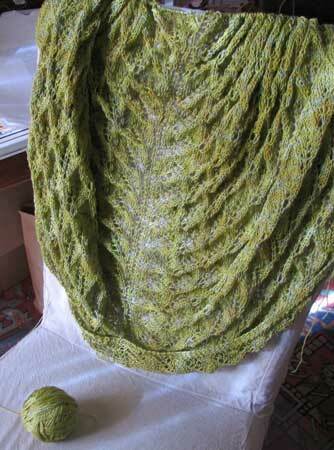 I worked on the cotton shawl, Kiri, and what obsessed me all week was the nagging worry that I might not have enough yarn to finish the thing. I have exactly six rows left to go. See? Ooooh I hope you have enough, I sweated on my last row, it takes forever and uses up enough yarn for three rows. I was prepared the second time. I’ll keep my fingers crossed for you. The shawl is beautiful. I can’t wait to see the finished product. By the way, what is the fate of Thing 2? I live in CA, and am a member of the Monterey Aquarium. They have a couple of those leafy seadragons, and I am always drawn to them…they are definitely one of the strangest things I’ve ever seen in my life. And so totally cool. keeping my fingers crossed over here! your trip sounded a lot of fun, and somehow very familiar, although i’ve never been there! I love leafy seadragons! Our local aquarium keeps putting them on display and then hiding them, I think just to tease me. Kiri is glorious. Very seadragon looking, if you ask me. I was six when I saw Rock City. Way better than South of the Border. Hm, that looks like maybe 35 grams of yarn, and the kidsilk haze I knit Birch out of was 50 grams a ball, and I got 20(-1 each row) 299 stitch rows out of it, so I think you’ll be fine. I’m on the optimistic side. Lonely over here. Good luck! Ann, it’s gorgeous. I think you should make 5 more of them while the pattern is fresh! You were in my future home! You’ll have to tell me the next time you go through Chattanooga, once I move up there of course – and Carrie (of Southern Fried Knitting) and I will show you around and take you to Genuine Purl, the fabulous LYS in La Nooga. 🙂 And rock city is The best! ann…. your little boys are so huggable! enjoy every waking (and sleeping) moment,…. for one day you’ll turn around to suddenly hear very strange and deep throaty voices….asking for the car keys!…. Sounds like you had a great trip. I love the leafy seahorse, it must be really amazing to see it move. I hope you have enough to finish Kiri – it’s looking beautiful. One good thing about the Birch pattern is the lack of panic about yarn at the end as the rows are getting shorter… of course you do have to cast on 300 stitches.. so swings and roundabouts! Kiri looks beeyouteafull. Are you done yet?……. Are you done yet?….. Are you done yet?… zzzzzz, c.
You’ve got PLENTY of yarn left. Really. In my last project I was worried I’d run out of handspun unrepeatable wool and I had almost enough left over to make a whole 2nd jumper (VBG). Everyone’s a pessimist! Sounds like a pretty fun spring break, all family vacations have their touchy moments. I’m having a hard time believing you can knit for extended periods of time without queasing, not genetically possible with our genes. You must have just eaten or something. What gives? Are you driving at the same time? Sounds like Kay is my neck of the woods…or I should say near where I used to live. I am now a mountain woman up in the Sierra’s! Too bad you ripped out the shawl. It s really pretty!